I just got back from the Carter Center Mental Health Symposium on Social Inclusion. I guess this is a prestigious invite, and I was expecting to meet people on the cutting edge of mental health research. I got invited based on my work with the Poetry for Personal Power program where I’ve helped get together over 1800 young people to talk on stage or listen to each other talking about what they do to get through adversity. 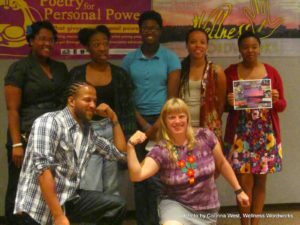 I had just came off a big blitz where I’d hosted 11 social inclusion open mic poetry campaigns at universities across Missouri. In the same 3 weeks, I’d also been to the Alternatives conference where I sold 60 T-shirts, hosted a caucus, a workshop, and did a performance of The Disability Industrial Complex for MindFreedom’s ECT protest. I’d done an all-day Judo demo to launch my Combat Arts for Recovery program, and then written a 13 page fellowship application. This might explain why none of my 4 blogs have been updated lately. Ben Druss, Dan Fisher, Paolo Del Vecchio, and Michelle Roberts at the “Integrated Care and Wellness” panel. So that was enough to help me get to sleep that night. I tried to relax and get through the conference. I know I’m both oppressed and oppressor, but I do what I can to tread lightly on people. First do no harm, after all. There was a mixture of people doing peer support work, people who loved their meds and labels, psychiatric survivors, policy makers, big time “key opinion leaders” getting big time NIMH funding, and former APA presidents. It was a mix of all the big names in mental health with a bunch of peer advocates thrown in. It could have been a dream come true where we have some real debates about what the real problems are and what the real solutions could be. I was excited for the invite and hoped some real change on social inclusion could be made with this awesome mix of participants who could finally ask some hard questions that need to be asked. We didn’t talk much about root causes of discrimination and prejudice, or specifically how to solve it. Personally, I think stigma comes from making temporary emotional distress seem permanent and scary. My working group was led by a new facilitator who let the conversation be decided by aggression and not relevancy. The keynotes that night were illness stories instead of recovery stories. They were about the worst moments of emotional distress but not about how people had found a way out to a new life, except that medications had big role in all the stories. I got to the mic for the Q+A after Elyn Saks’ keynote, which was pretty similar to her TED presentation. I was a bit keyed up and didn’t hear the answer but it sounded to me like, “We don’t really know.” But when I got back to my table, my friend said, “No, she basically said, ‘Just try the meds and if they work, it was biological.’ But that has no basis at all in science.” Whichever answer was closer to her real answer, I just walked away laughing, because it was so different than anything I know to be true. So different it was just like speaking a foreign language. During the whole symposium I felt like I was a bilingual person among people who only had ever heard of the one language. That’s why I host an internet discussion group, to come up with language that both regular civilians and mental health providers can understand and actually hear without getting too scared. We’re labeling people with permanent illness who might have had temporary problems, simply an overwhelming of supports. Then we are giving them medications/drugs that might help some, but for many might be making the temporary problems into chronic problems. Then we have social supports that make it very difficult to leave this setup. All mental health people desperately need to ask themselves if this is working. 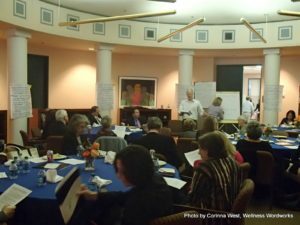 So six of my fellow advocates got together and made a statement about how we felt about the Carter Center mental health conference. We’ll get a printed version of this statement released fairly soon, but what we came up with on the fly at 11 pm in a hotel room after a full day of trauma still needs some revision. But I still don’t feel right after the conference. Something is clearly wrong in the upper echelons of mental health that I don’t understand. There is some kind of blindness to the facts and data that I totally don’t get. I talked to my mom, who is a Shaman, about this. She said, “If they can’t hear your data, all you can talk about are your feelings.” So I’m going to follow her suggestions and simply share my feelings. Angry – How long can I say the same message without being heard? Why don’t people who are paid good money to “help” us actually do their jobs? But on the other side, how can I give them information in way they can hear it? But then why do I have to change MY message when it’s THEIR job to find what works? Scared – I am wondering how many more of my brothers and sisters with mental health labels are going to have to die of medication “side effects” like the 18 fold increase in heart attack risk caused by combining psych meds. By the increased suicide rates from the lack of hope that people like me experience when told they have a lifetime illness instead of a simple existential crisis. Hurt – I have created a great Poetry for Personal Power approach to social inclusion that doesn’t rely on labels and medications. 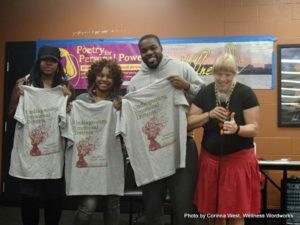 I’ve got great buy in by the communities that are engaged, and you too can now get paid to replicate the Poetry for Personal Power program. We’ve got a first take at a “mental health fair trade” or “medication optimized” certification program for the general public. Why was I invited to a conference when people didn’t want to hear from me? I feel like I never got a chance to explain my program. I probably told about 15 people my elevator pitch, and they all said, “That’s nice.” and walked away. This is typically the reception I get with mental health providers. 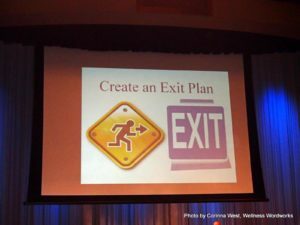 For the most part, the only people who understand a need for an exit route out of mental health care are people in the general community. I interact a lot with people in the bicycling, poetry, spiritual, or entrepreneurial communities. 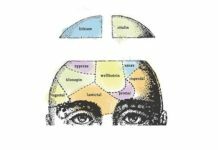 When I tell them I am building an online community to help psychiatric survivors share information about complete recovery, they say, “Oh, that’s great, we need that so much.” Then they tell me the story of Uncle Jim or Cousin Juanita or even themselves who had a “permanent” label but found a way out. But people in the mental health policy communities never hear these “escapee” stories because they all suffer from Clinician’s Illusion – they only see sick people. And I’m not just a naysayer. I’m a doer who needs a new plan. But in some way, I can’t get beyond the criticism this time. I just feel like I have watched the genocide long enough and it gets to me. Almost every day I hear of a new friend or family member who doesn’t know about safe medication withdrawal techniques and thinks that their withdrawal effects means they indeed have an illness. The Carters were amazingly progressive in 1978 when they did the Commission and they were the very first to invite consumers to the table and to actually listen. 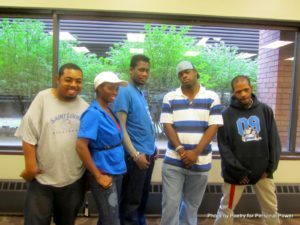 They started the Community Support Program, which lead directly to the development of the understanding of recovery, they funded progressive programming. They were amazing at the time. You are so young that you don’t remember that people were still being sterilized and used as slaves in state hospitals and could not vote in the 70’s in many states. A lot of people at the conference were people she has been working with since then. No one in America is hardly talking about true community inclusion yet. That is what we have the gift to do, because all of us are really into inclusion and social networking, and the arts, antipoverty work, peer support, wellness, transportation and everything that has brought us to national level work. The way the internet and social media is changing the world, we really don’t need big money or big connections any more. The traditional powers need us, but we don’t actually need them. And that’s what I realized this week at the IT and entrepreneur conference I went to when I got home. It would be nice to have some of the $4.9 million that NIMH is giving Robert Gibbons to keep spreading statistical lies about antidepressants that increase teen suicides. It would be nice to get part of the $401,675 for each of 5 years that NIMH is giving Charles Nemeroff to prove PTSD is somehow (huh?) genetic. AFTER he was fired for non-disclosure of pharma payments, AFTER being suspended from a previous NIMH grant. 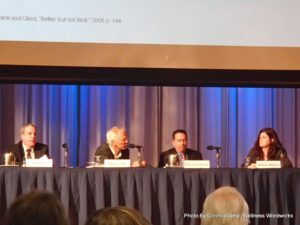 It would be nice, even, if something actually happened to the suggestion that was made at the Carter Center symposium to include real and significant reviews and points for consumer/survivor involvement in NIMH grant activities. But now, in the age of Web 2.0, which simply means interactive like the blog comments I want you to put below, we don’t need any of this. We can bootstrap this ourselves. Just the concerned doctors and parents and mental health civil rights workers that read and write this blog. We can fund each other on Medstartr to do research like figuring out outcomes for peer support centers. We can research out of our garages through contract labs to get assays done like how much meditation lowers cortisol compared to antidepressants. We can do a survey monkey review of 100 people who came off medications to see how they did it. The doctors in this community can look through a clump of their patients’ records like Sandy Steingard did to see how and why people can come off medications, or what truly helps people take back their lives. I’ve got an editor wanting us to put together a special edition in Frontiers in Psychiatry about coming off meds, so lets just get it happening. 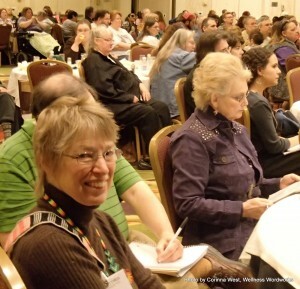 My mom, Gwen Broz, with Dr. Jean Campbell in the background at Alternatives 2012. 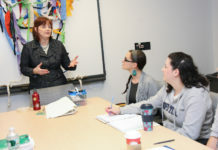 She spoke on using spiritual traditions in modern culture. 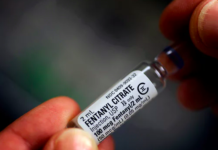 Why Are So Many People Dying From Opioid Overdoses? There is no more paradoxical and confounding industry out there like the mental health industry. I like how you follow the money trail a bit more than most bloggers here at MIA. 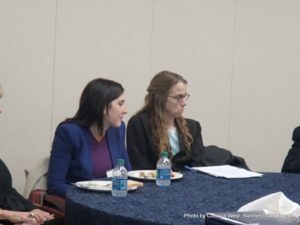 I think your most powerful realization is that the general public is probably more receptive to recovery without medications than the mental health field is, and that is who needs to be educated about what really works for people trying to survive a psychiatric diagnosis of lifetime illness. I’ve noticed the same thing as Emily, that the general public has been far more receptive to recovery, reducing/eliminating drugs, the idea of trauma and that “labeling” is not helpful. This was great perspective Corinna. Many don’t get a chance to run in the same circles you do so thanks for sharing what happens at “these places”! Thanks David for attributing to me the idea of looking to the general public but it is not mine. It is what I read from Corinna’s post. She is out there doing some really important work! Congratulations for trying, they don’t sound very receptive or concentrating on, “Recover,” either. I went to a training workshop by George Lakey (he has a blog on the site, Wageing Nonviolence) where he said we often concentrate on, “the enemy,” the people who believe the opposite of what we do. He says we should concentrate on those who are nearer to us, or who are neutral and then try to get them to move more towards to what we believe. If we move enough people towards us then the people who believe the opposite have not support. How this works in our struggle I don’t know at the moment, but I think it is worth considering. John, I really like that principle. Being able to engage in a good-faith transforming conversation with people close in goals or beliefs seems both a good strategy. It might also be a test of credibility: that approach seems easier than curing people from emotional distress, so when reaching for the latter, it is important to convince ourselves and others we can do the former. I think social inclusion must focus on connecting with the larger society, not the small world of the mental health system. We must change the larger social conversation. Thank you for this post. It aptly expresses how I feel almost each and every day that I work as a peer guide. On my part, I’m tired of hearing how we ex-patients and survivors need to try to “understand” and “build bridges” to the people running the system. I’m tired of hearing how we have to be careful of not being forceful and strident because we will only alienate them rather than bring them to agreement with us. I’m tired of being told to “tone down” and to “couch our truths and experiences” in terms they’ll understand and not be offended by. To me this is like being told to lie. Why is it that we are the ones expected to do all the work while they sit there with those superior looks on their “professional” faces?! We’re expected to build 100% of the bridge and then 99% of them refuse to meet us halfway. Something is not right about all of it. Just don’t ever forget that you’re not just challenging their opinions or beliefs, you are challenging their careers and their jobs. They don’t want to listen to the people who have recovered because such people are not paying their salaries anymore. They don’t want their patients to wind up like those people because then they will be out of a job. You’ve got that right! A great percentage of them need to pursue training for a different career so that they no longer have to be quacks pretending to work at a profession. One of my husband’s favorite stories is about this libertarian dude who tried to talk sense into the Republican party. Like pointing out the Spanish speaking people are typically socially conservative, entrepreneurial, religious, and family oriented, things that would trend them toward being Republicans if the Republicans would just stop bashing immigrants. Yeah, I totally agree that going to events like this is a complete waste of time. I don’t understand those folks who get all excited that they are being allowed in the same room with the “elite.” I think people who think like that are pathetic and completely without self-respect. I love the quote from some bureaucrat or other who says you can’t call him a butcher and expect him to listen to you. Who the f— cares if he listens to us? I say, call him the butcher he is, and then refuse to listen to HIM. Enough of this nonsense! Let them have their self-congratulatory conferences! Let our “consumer leaders” be just as obsequious (trying to avoid the much more accurate four-letter words here) as they want. They represent absolutely nothing, and will disappear as soon as the funding goes. People know what really needs to be done. Let’s do it! Amen and pass the ammunition! ‘Cause I think you may have missed the whole point of this post, which is that criticism and nastyness doesn’t get anywhere, really. So it’s time to find another way to talk to people who can’t hear us or just give up on them and move on and build our own solutions. Interesting video. Creates lots and lots of questions. Thanks for video link Marian, I found it very thought-provoking, and the pointer to Endgame by Derrik Jensen. A government leader in mental health yesterday said in an Email to me that I was “selfish and unreasonable”, for challenging him and his team, for making various user organisations ‘arms’ of the government. As in ‘he who pays the piper calls the tune’. I refuted this, the cheeky so and so, and said so back then forwarded his Email on to some others in leadership. And will write some blog posts about it in a day or two or more, for “revenge is a dish best served cold”. I’ll contribute to this. Let’s coordinate. I would think the most valuable way to spend one’s time at one of these meetings is to do a presentation.